One of the things I love about Thailand is the presence or abundance of historical buildings. As a lover of history, these are the places that I want to visit. I am always amazed at the durability of these buildings, how it was built without modern tools, and of course, the story behind it-how they've lived their lives before. In Thailand, there are lots of historical buildings; from temples, to pagodas, mansions, palaces. It's really amazing how they've preserved these sites. One of the beautiful palaces that you can visit is located 1 hour drive northwest of Bangkok in the province of Nakhon Pathom. It's called Sanam Chandra Palace or Sanam Chan. Its name was probably derived from a natural pool nearby called "sa nam chand". It was built by then crowed Crown Prince Vajiravudh who later became King Rama VI. It was built in 1901. 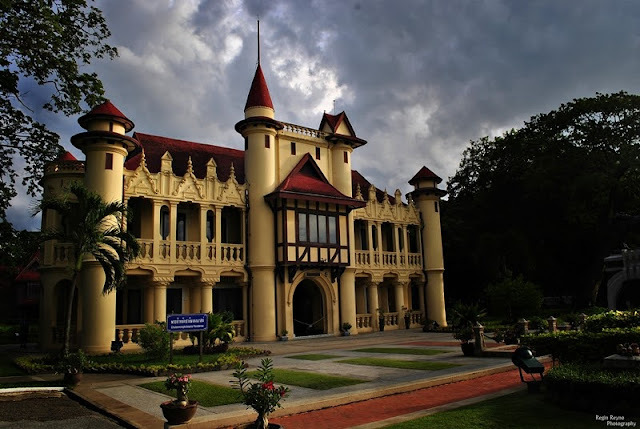 It was actually built as the royal family's rest house whenever they go to Nakhon Pathom to pay homage to Phra Pathom Chedi or whenever they visit nearby provinces to monitor the development of the Kingdom. 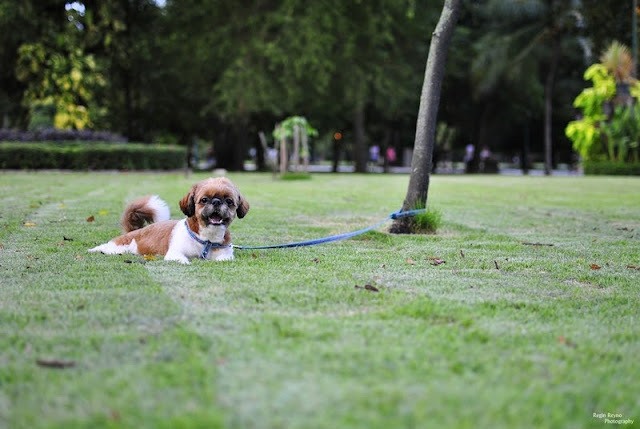 It is situated in the west side of Phra Pathom Chedi in a well kept park. The park is so beautiful with manicured lawns, shady trees, small lake, and a small river that runs through it. It is a great place for relaxation. There are actually five buildings on the palace grounds, namely Chaleemongkolasana Residence, the Bhimarn Prathom Residence, the Samakkeemukamartaya Hall, the Mareerajaratabulung Residence and the Thub Kwan Residence. There's also a shrine to the Hindu god Ganesha at the center of the grounds. The king's main residence, called the Chaleemongkolasana Residence is a European-style palace. It has an English and French architectural style. Looking at it, it's as if you're not in Thailand. In front of it is a monument of Yah leh, the king's favorite dog. A crossbreed, who was accidentally shot. He loved the dog so much that he built a monument for him. It has also a footbridge that connects it to Mareerajaratabulung Residence, the other residence in the palace grounds. Nowadays, the palace grounds is open for public for free from Tuesday to Sunday. The residences are now museums in which you can enter at 50 baht per person for foreigners and 30 baht for Thais. Silpakorn University is very near the palace, and why you can see lots of students jogging every afternoon. Lots of locals go here too to relax, especially weekends. Statue of King Rama VI. A dog lover. For sports enthusiasts, there are sports facilities in the area too. If you want to relax, there are places in the area where it's so quiet and you can just lay on the grass, meditate, look at the still river while on the bridge, sit beside the lake and feed the swans, or just read a book. This is one of most relaxing and beautiful places in Nakhon Pathom. Wild animals abound in the area too such as monitor lizards, squirrels, different kinds of birds and fish. Visiting this palace, I can imagine how the royal family relaxes here before. It was really designed to be very relaxing and fresh. It's a great opportunity that we, commoners, can actually experience a bit of their life too by visiting, and hanging out in this place. So whether a history buff, a sports enthusiast, or just want to relax, head to this beautiful place in the heart of Nakhon Pathom. -from the hospital take a motorcycle taxi to Sanam Chan Palace. The fare is 30 baht. What are some of the beautiful palaces that you've been to?